The good news is that your Chanhassen dentists have a solution. Rather than deal with the development of a crossbite, misaligned teeth, or other related problems in the future, you can use a habit appliance to help your child kick this bad habit before it causes harm. A habit appliance is a lot like a retainer that an older child might wear after braces. 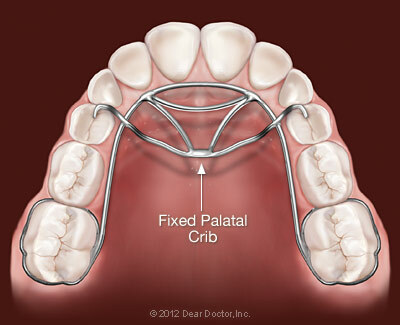 It is made from metal with semicircular wires that form a palatal crib. Your dentist can attach the appliance just behind the upper teeth. With the crib in the way, your child is then unable to make contact with the roof of the mouth with their fingers and thumbs. Preventing this contact results in the patient feeling no pleasure in sucking. And without that pleasure, the habit fades away. Some patients have found success with the habit appliance after just one day. Whatever the timeline, once you and your child’s dentist agree that the habit is broken the appliance will be removed. Another habit that is natural for young children is tongue thrusting. When infants swallow they have to thrust their tongues backward in order to get the food safely down. As children grow, the habit becomes less and less necessary and most children grow out of it by age six. 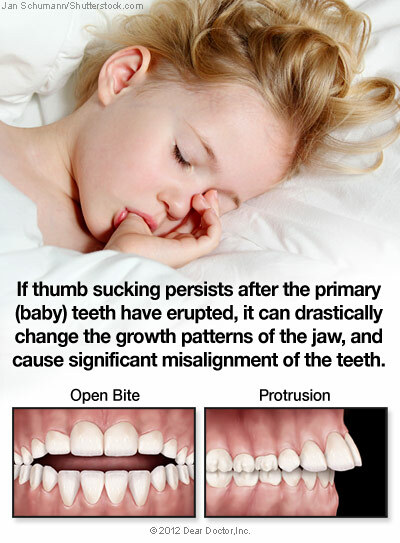 However, in some cases the habit persists, thus causing issues similar to thumb sucking to develop, such as crossbites, misaligned teeth, etc. Luckily, your Chanhassen dentists have appliances to help with that too. The tongue thrusting appliance is similar to the palatal crib used for preventing thumb sucking. The only difference is what the crib specifically blocks. Just as the appliance for thumb sucking keeps thumbs at bay, the tongue thrusting appliance gets in the way of the tongue, eliminating access for thrust. As your trusted dentists for the Chanhassen area, we believe there is nothing more important than your child’s oral and dental health. Contact Bluff Creek Dental today to get your son or daughter started on improving their dental and oral health through thumb and finger appliances.